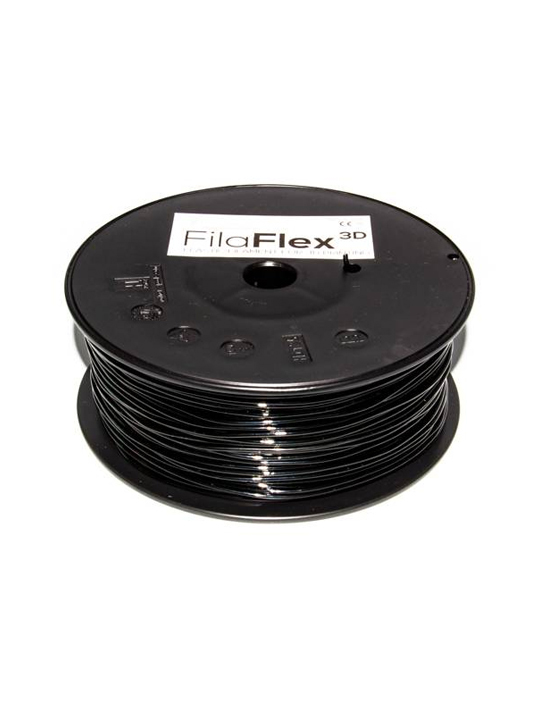 3d printing, 3D printing filaments, consumables, Filaflex, filaments, flex, flexible filament, flexible filament, spools. created by Recreus for 3D printing, 1.75 mm diameter, 250 grams of material. Recreus creates fantastic elastic filaments for 3D printing: in fact they are TPE (thermoplastic elastomer) with a polyurethane base plus some additives to make all works better during the printing process. Every filament has an important elasticity that permits the creation of all of the flexible parts of your next project: it become possible to print stuff like shoes, flip-flop and havajanas, junctions, sealings, elastic hinges, minifigures, more secure toys and so on. Using right configurations it will be possible printing perfectly with Filaflex without any kind of problem: for this reason normally this material is considered printable with every model of FDM printer. If your extruder is not equipped with internal PTFE tubing, it’s better consider these raccomendations: 20mm/s for reference printing speed at 240° and pratically no retraction, max 1mm at 30mm/s; extrusion percentage at 105/115% if the flow is not regular; if necessary it’s better reduce the pressure between the counterspring and the gear. Last but not least, the producer told us to advice this fantastically useful article, written by Gyrobot: How to print with flexible filament.